Some friends and I went to play bingo the other day. Yes, I am still 26 years old. However, I do enjoy trying new things occasionally (as long as they don’t involve heights, speed, or any kind of spider), so off to the bingo we went. I’ll admit, I’m not convinced. I don’t think my brain works quickly enough for bingo – major props to any bingo-playing folk who have a clue what they’re doing! I was spending so long looking for each number that I had no time to actually assess my board and decide whether or not I’d made any lines – meaning it felt a bit like a rubbish version of colouring in, where you’re only allowed to use one single felt tip pen, and there’s a vaguely smarmy man incessantly shouting which part you have to colour in next. I also found myself subconsciously adding up how much we’d spent on games as the night progressed, and wondering how many glasses of wine I could have had if we’d just gone to the pub instead. Luckily, my husband is a bit more on the ball than I am and came away with £250 winnings, which certainly helped to ease my resentment a little. Now I just have to hope he’ll share it with me. Either way, it’s reinforced my knowledge that I’m more cut out for simple things that don’t require too much concentration. Like this marinated roasted cauliflower – it’s easy, it’s straightforward, and it’s super tasty. My favourite thing about this recipe is that the marinade and the herby yogurt sauce are actually basically the same thing. Remember: very little brain power here! 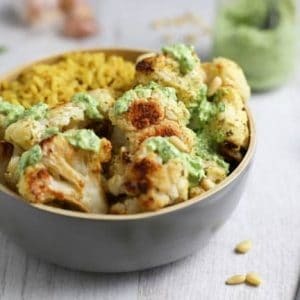 Just whizz up a few ingredients, and use about half of the mixture to toss with the cauliflower before roasting, giving it a lovely flavourful coating. Then add a nice big handful of extra herbs to the remaining mixture, along with some lemon juice and a small drizzle of olive oil, and whizz it up again to make the sauce. One food processor for both mixtures = less washing up = happy Becca. Remove the leaves from the cauliflower, and cut into florets. Place the florets on a large baking sheet, and set aside. Add the pine nuts, garlic, and a small amount of parsley to a mini food processor, and blitz to form a paste. 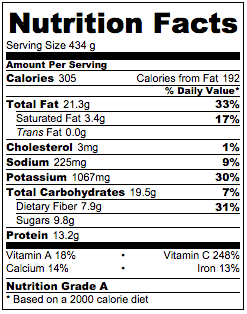 Add the Greek yogurt, and blitz again to combine. 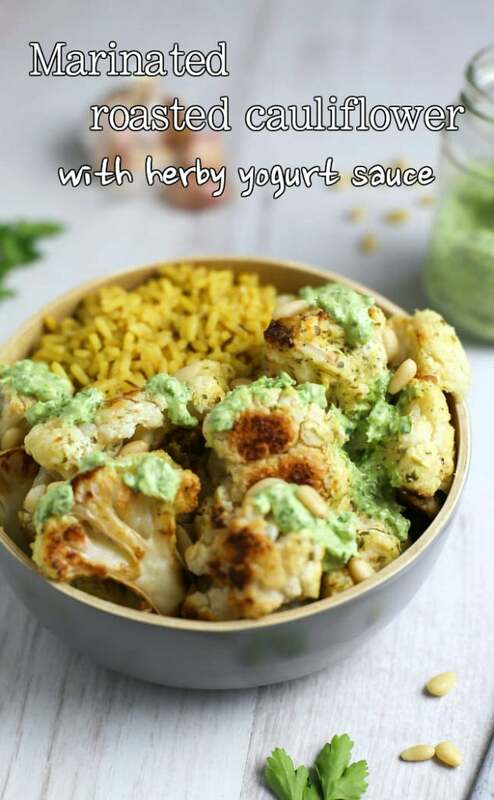 Dollop around a third or half of the yogurt mixture onto the cauliflower, along with a small drizzle of cooking oil. Mix thoroughly to combine, and roast for about 45 minutes, or until the cauliflower is lightly golden brown. 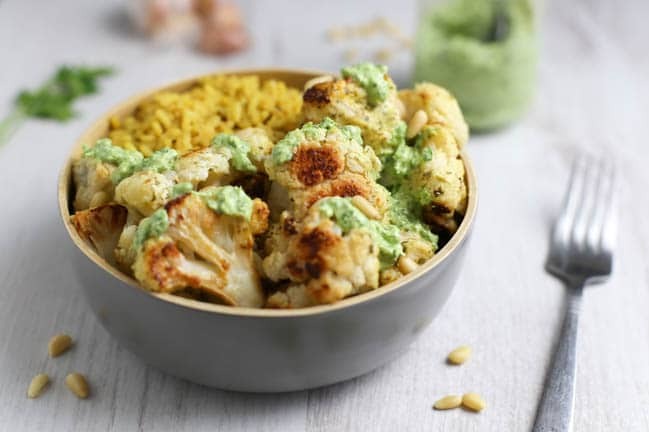 While the cauliflower is roasting, add another big bunch of parsley to the remaining yogurt mixture in the food processor, as well as the lemon juice, extra virgin olive oil, and seasoning to taste. Blitz again to combine. When the cauliflower is ready, serve it with the yogurt sauce. « Previous PostAmuse Your Bouche in 2015: A Year in Review! Next Post » Slovenian struklji (apple dumplings) – and a trip to Ljubljana! Hehe, easy, straightforward and super tasty does it for me. 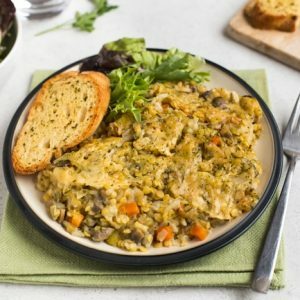 Love your idea of a two in one sauce and roasted cauliflower is quite delicious. And what a clever husband you have, definitely sounds like it was worth going to Bingo. This looks really tasty and vibrant Becca! I’m loving the sound of the sauce! I just adore roasted caulirflower. It is definitely one of my favourite snacks. Haha, I want to go to bingo. I don’t think I would be very good at it though. 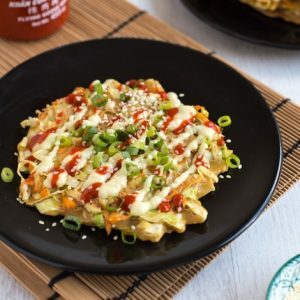 Cauliflower is such an underrated vegetable, but I love it! I’m going to roast some and blitz it into a creamy soup this week. 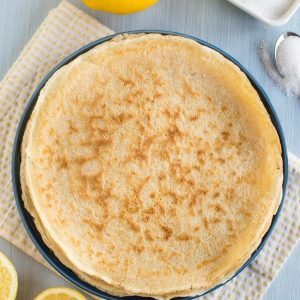 Love your recipe! 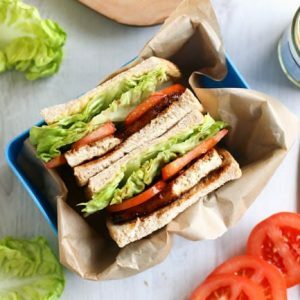 Ooh, this looks fab and I could easily veganise it for Veganuary by using soya yoghurt. Oh I love, love, love the sound of this! Bookmarked to try later! Yum! I have two gigantic caulis in my fridge, now I know what I’m doing with them! Pinning both recipes immediately, thank you. The one and only time played bingo was when my eldest was at first school – I had no idea what I was supposed to be doing and shouted out at totally the wrong time – the serious bingo afficionados were scandalised and my boy was mortified! 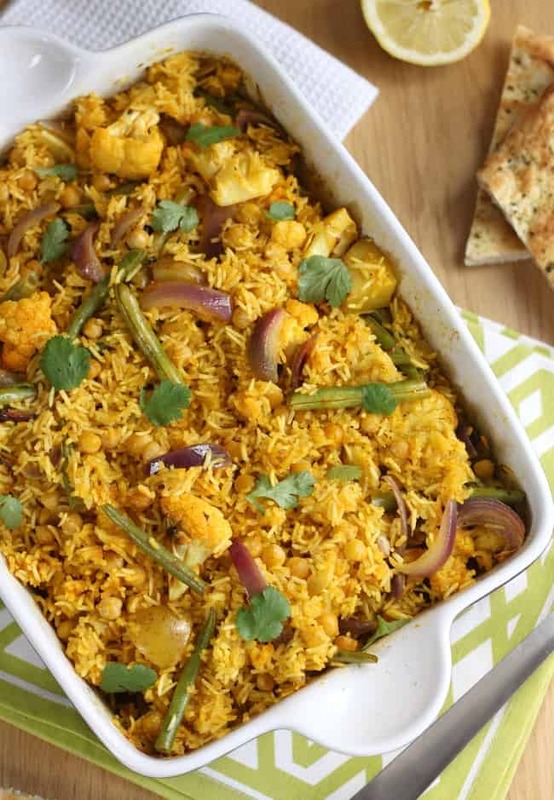 I love cauliflower and yoghurt is an essential part of my diet, I like the simplicity of this recipe and that biryani looks yum, can see now why it is so popular ! I’ve been eating cauliflower almost weekly this season and especially love it roasted! I tend to use a mix of spices, but have never tried roasting it with yoghurt! Such a fantastic idea! Oh. My. Days. 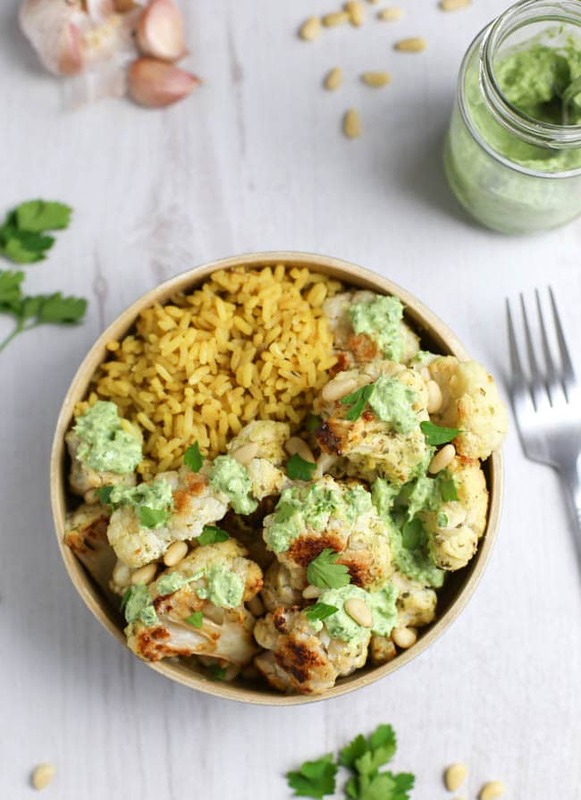 Cauli is my fave veg in the world and this looks delish. I normally stick with boiled or cauli cheese or cauli mash as a healthy alternative with somwthing a bit naughty like sausages. I’m not actually a fan of boiled cauliflower, but I LOVE it roasted! 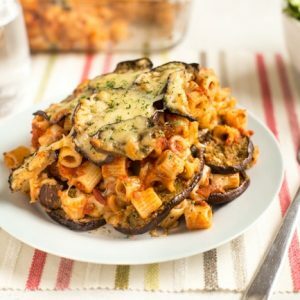 Oh wow, that looks amazing! 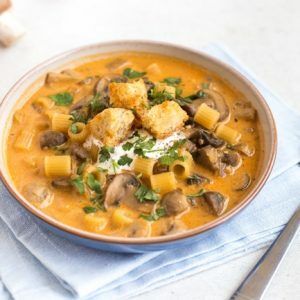 And the ingredients are making me drool :O Do you think I could sub soy yogurt for the Greek, or is it not thick enough? 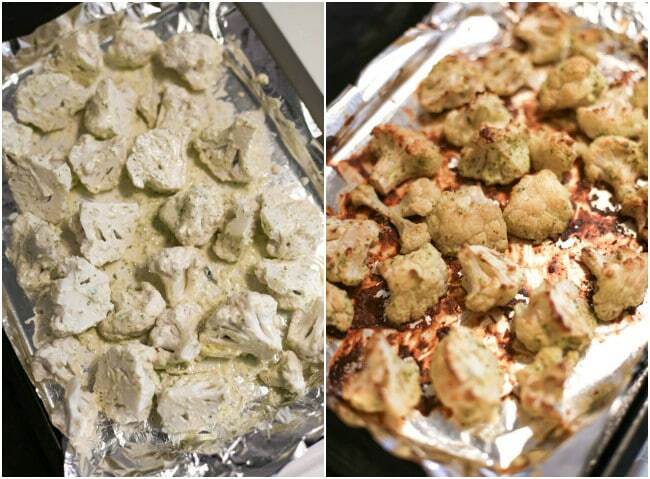 Look delicious, I always forget how much I like cauliflower, will have to try this recipe. Honestly, I’m a total cheat, and it was a shop-bought pilau rice. But I’m sure anything tasty would work! I’ve not really explored the world of cauliflower – it’s always seemed really bland to me (childhood trauma, obviously!) but I had some incredible cauliflower at a new restaurant near me recently which was charred and totally more-ish so I think I’m ready to dip my hand into trying it myself! 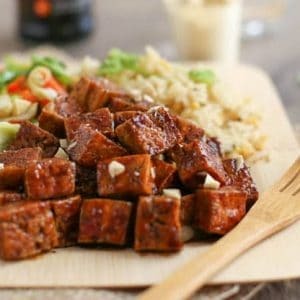 Marinating like this seems like a good way to avoid the blandness of the boiled cauliflower I have had in the past – this looks yum!